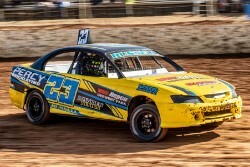 Nathan Russell has won the Tasmanian Street Stock Title, at the Cranes Combined Carrick Speedway on Saturday night, with a barnstorming performance, coming from position twelve to take the lead in the concluding stages. Corey Jetson and Corey Bauld would start on the front row after the nine qualifying heats were contested, with Troy Russell and Luke Williams on row two. Bauld took the early lead, but Williams took the lead away on lap three, as Russell settled into third place, while Jetson dropped to fourth. Dale Riley Jnr started to make his presence felt, moving to fourth place on lap seven, and moved to third on lap twelve. Meantime, on the same lap, Nathan Russell had made his way to sixth place, with nothing separating a good proportion of the field. Steven Harvey, who finished third in last years title, also started moving through the field, and took third place from Riley Jnr at the half way mark, as Nathan Russell took fourth place, as Riley Jnr slowly went back through the field in a hectic race, with plenty of positional changes. Bauld was still chasing Luke Williams, but Bauld soon had to contend with Nathan Russell who moved to third place with ten laps remaining. A lap later, Russell took second place, and with five laps remaining, his ascension to the lead was complete. In a desperate final few laps, Russell held off Williams to win his first Street Stock Title by two car lengths. Steven Harvey finished third for the second year in a row, with Corey Bauld a distant fourth, while Matt Templar and Troy Russell rounded out the top six.